If You Have Allergies, This Can Help! Nutone’s most powerful Centralized Cleaning System offers conveniences and cleanliness unavailable just a few years ago. This modern system is much lighter and easier to use than most standard uprights and provides up to five times the suction and cleaning power of most portable vacuums on the market today. 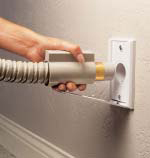 Then, after removing more dirt than other vacuums, it vents the exhaust outside your home, not back into the room. 100% of all particles, allergens and other pollutants you have vacuumed up….GONE! Nothing gets re-circulated in the room! That’s above any of today’s HEPA or ULPA vacuum standards. In addition to particulate matter in your home, these modern cleaning systems also help to reduce another pollutant, “Noise”. With a high efficiency, insulated and muffled power unit mounted in a remote part of your home, these systems are so quite that you can vacuum in a sleeping baby’s room with no worries. *Optional or expanded rooms, a finished basement, or any other changes that expand the floor area of the home, will require that additional vacuum inlets be ordered. This option allows the homeowner to install the “vacuum piping only” now and purchase the vacuum motor and other components later. This option provides future inlet locations on the 1st & 2nd floors. Basement inlets may be added in the future before you finish the basement. Provides sufficient Wall Inlets to provide coverage for a finished basement. Purchase of Central Vac System option for 1st & 2nd floors is required. This option allows the homeowner to install the “vacuum piping only” now and purchase the vacuum motor and other components later. This option provides future inlet locations on the first and second floors as well as the basement of the home. Basement walls must be roughed in while the house is still undergoing its original construction. The addition of optional rooms in your new home may necessitate additional vacuum inlets. 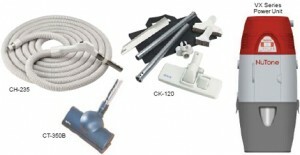 Purchasing additional sets of cleaning tools allows you to leave a set on Central Vacuum Systemseach floor. This kit was designed to meet your cleaning demands in your garage andCentral Vacuum Systems automobile. 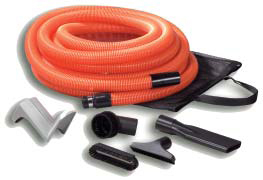 With a 50’ Bright Orange Crush-Proof Hose and a complete set of vacuum tools to leave in the garage, you’ll never have to worry again about accidently tracking grease and mud back into the home when you’re done cleaning. to every car in the garage. The flip of a toe-switch turns on this automatic dustpan allowing you to quickly sweep away dirt. While the Vac Pan is most popular in the kitchen / mud room area of the house, mounted in the base of a 2 x 6 wall or certain cabinets, it is equally at home in the master bath or any other area that needs to be swept frequently. The installation of a Vac Pan varies with every location it is placed in. The home buy must inform their builder if they purchase this option so that the builder can make the appropriate adjustments during construction in order to allow for flooring thickness, cabinet base openings, etc. to accommodate the Vac Pan. A common problem experienced when installing Vac Pans occurs when ceramic tile is installed on the kitchen or bathroom floor, but not installed under the base of the cabinet where the Vac Pan is to be located. This reduces the space between the floor and the bottom shelf of the cabinet and prevents the Vac Pan from working properly. The home buyer is responsible for making sure that their builder is aware that this option is to be installed and has made the appropriate allowances to accommodate it. Failure to do so may result in the Vac Pan not operating properly. This Deluxe option upgrades the main floor-cleaning tool in your system, the Air Driven CT-350B Floor Brush, to the powerful Electric Motor Driven Floor Brush, the CT-600. The CT-600 is especially recommended for use with medium to deep pile carpeting. 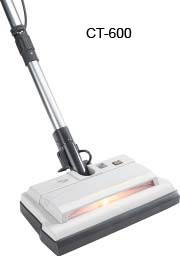 The motorized unit provides all the beater-sweeper action of the best upright available. To complement this deluxe floor brush and upgrade all the tools, the Standard CH-235 Vacuum Hose is replaced with the Deluxe CH-515 Hose and the Standard CK120 Tool Set is replaced with the Deluxe CK230 tool Set. The CH-515 includes additional features such as an ergonomic handle with fingertip control of the entire system. In addition to allowing you to turn the system on and off while the hose is still inserted in the wall inlet, you can easily adjust the vacuum pressure in order to go from vacuuming the floor at full suction to vacuuming upholstery with lower suction. This option requires electrical outlets, near each vacuum inlet, in order to plug in the electrical cord portion of the hose to power your new tools. This option provides an additional complete set of cleaning tools, including the CT-600 floor brush and CH-510 hose described above, as well as the CK-230 tool set. An additional tool set on each floor adds to the convenience of a central cleaning system. These two ply electro statically charged filter bags capture particles down to .10 micron while allowing the vacuum air and remaining particles to exhaust outside your home. On the average, nationally, you will only need to replace the bag about twice a year. When you first move into your new home, however, because of the power of the NuTone Central Cleaning System, its ability to capture such small particles, the initial fiber loss from new carpeting and the general debris generated by moving in, you may need to change your filter bag after just a few weeks. Remember, filling the bag sooner than you might expect is evidence of the power and effectiveness of your new NuTone Cleaning System. Check the filter bag frequently when you first move in.